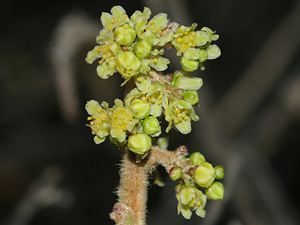 Description: The flowers appear before the leaves and are densely clustered at the branch tips. The individual flowers are tiny, sessile, and have 5 yellow petals and 5 yellow-green to reddish sepals. The flowers are followed hairy, sticky, scarlet berries. The alternate, compound leaves are divided into 3 shiny, dark green, oval-shaped, lobed or scalloped leaflets. The leaves turn orange or reddish in the fall. These shrubs are well-branched and can form dense thickets. Skunkbush Sumac has "leaves of three" like the related Poison Oak or Poison Ivy (Toxicodendron species), but its leaves are not dangerous to touch and it has red berries instead of white ones. Note: Sources now consider Rhus trilobata to be Rhus aromatica var. trilobata, an ill-scented variety of Fragrant Sumac (Rhus aromatica). Rhus aromatica has foliage with a pleasant, citrusy scent. This page will be updated to reflect this once ITIS and/or the USDA Plants Database (the map source linked below) are updated. 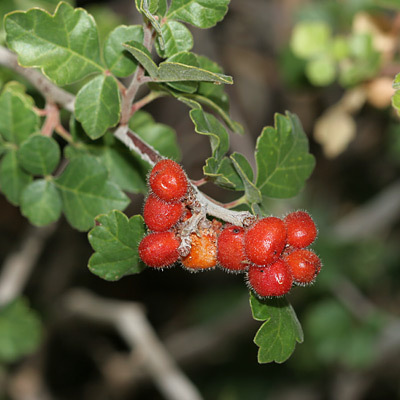 Culturally Significant Plant – Native Americans used the fruits for food, beverage, and medicine and the pliable young stems for making baskets. Edible – The red-orange ripe fruits are edible and can be soaked in water to make a refreshing, lemonade-like drink. Foul-smelling – The crushed or bruised leaves have a foul, skunky smell.